After hours of research and trying on countless shoes you’ve found the perfect pair of genuine leather shoes Whether a wingtip or a loafer your new investment needs to be cared for so you can enjoy them for years to come, shoe care starts with the right polish or cream. This article focuses on protecting your favorite shoe. Ideally, you want to apply shoe polish every time your shoes are looking a bit roughed up to keep them looking good. But with the amount of shoe polish and leather care options on the market, it can sometimes be hard to choose which option is the best for your particular leather. We've updated our top ten shoe polish list to include a few new top-notch products, and updated our Criteria section to help you better understand how ingredients in the polish can affect the leather of your shoe. Be sure to read through to help you select the polish best for your favorite pair of shoes! Founded in 1921 in Oregon, USA, this product was originally created to help protect logger’s boots against the elements, but also to help the leather last the rough and tough Great Northwest winters. 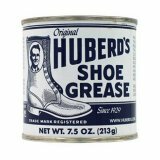 Since then, they’ve expanded their product line for a variety of leather goods, but still keep the classic leather shoe protectant they were known and loved for, Huberd’s Original Shoe Grease. Beeswax based, this product includes several conditioning oils sure to keep your shoes supple for the long haul. Beeswax provides a weather resistant quality to help keep out water and liquids, while the conditioning oils help soothe cracked leather and maintain flexibility. Several other products from Huberd's now combined this classic version with other oils for even more protection against the elements that worksites may encounter on a daily basis. With a product such as Huberd’s, that’s been on the market since the 1920s, you can be sure there is a reason for its heritage and the quality of the product. Since the Original Shoe Grease was made with loggers in mind, it’s a good bet those hard workers encountered downpours, muddy conditions, and an environment that abused the leather boots that kept their feet safe. You can feel comfortable knowing that your shoes get the protection a work boot requires to keep your leather shoes safe! Protection like this doesn’t have to come at a premium with Huberd’s. Coming at a similar price for our top picks on our list, but in a 7.5-ounce container, you get double the product to help protect your shoes. If the color pigment is something you don’t require, but sturdy protection and conditioning are, Huberd’s Original Shoe Grease is for you. Imported from Paris, France, Saphir Médaille d'Or Pâte de Luxe is a top of the line show polish considered to be the best in the world based purely off its combination of 10 different high-quality wax types. In addition, this shoe polish boasts a great all natural smell as well as comes in 8 different colors to match your leather perfectly, truly a premium product. The Pate de Luxe Saphir Medaille d'Or comes in an easy to use wax that proves great coverage, perfect for using on any leather shoe. It is composed of multiple different waxes, including Beeswax and carnauba wax, each with their own specific technical properties. Combine this with a natural turpentine oil, and it’s clear how this has become a well-loved product. The complex formula incorporated into this particular brand of shoe polish provides a sleek and glossy finish while the pigments utilized in the color options bring fantastic penetration as well as transparency to create a quality and exquisite shine. It’s part of the reason it’s a gold medal product, as the French name suggests. While the price may be a bit more on the expensive side compared to other brands of shoe polish, mainly as a result that the product is imported, the quality definitely speaks for itself. You’ll discover it’s supreme effects after you apply your very first coat to your shoes. If you’re looking for a top of the line shoe polish to really spice up your clothing regardless of price, then this is what you should shoot for. With all the leather shoes and boots that Dr. Marten’s is known for as a brand, they’ve also made sure to create a product to keep those shoes looking fabulous. Dr. Marten’s Wonder Balsam is a mix of several components to help your shoes maintain suppleness and keep them protected from the elements. The best part of this treatment? No polishing is required!!! Simply wipe this top notch product onto the shoes, and wipe off. Many polishes out there are color tinted and do require that you buff the polish to give a shine. Wonder Balsam helps the integrity of your leather shoes for long-term durability and life and requires no buffing. Simple wipe on the Balsam, leave for 5 minutes and wipe any excess off the shoe. You’ll notice an immediate difference in sheen, though this won’t have that ‘mirror’ finish most other polishes have. Wonder Balsam is made with beeswax, coconut oil, and lanolin, perfect to help break in stiffer leather shoes. This kind of treatment helps to protect the shoe against salt marks, scuffing, and any water or liquid your boots or shoes may find themselves stepping in. It has a nice light smell to it and comes with an application sponge. A bit more expensive than other smaller polish treatments, this 2.5 ounce supply is still worth every cent spent. With its easy application and striking results, Dr. Marten’s really has created a quality product. If you’re looking for a product that nourishes the leather of your shoes and extends the lifespan of the shoe considerably with regular treatment, this product should find its way into your home! Otter Wax Leather Salve is similar to a combined polish and leather moisturizer all in one. Consisting of natural shea butter plus a carnauba wax as the main ingredients, it helps to keep luster and pliability to the leather quality of your shoes or boots. With a little more arm work to polish up your shoes to a glow, this Leather Salve is sure to keep your shoes, and other leather products, looking young long into the turn of the century. Otter Wax has a proprietary blend of butters, oils, and waxes blended into their Leather Salve, the two main components being carnauba wax and shea butter. It’s intended use is as a deep conditioner for leather, helping to restore luster, and keep the material supple and soft. If your shoes are looking a little dried out and cracked, simply apply a treatment and revel in the results! The Leather Salve does require a bit more time if compared to Dr. Marten’s Wonder Balsam, which ensures proper uptake of the moisturizing products, and extra polish to help buffer up a shine. Within 10-20 minutes, most of the product will be absorbed by the leather, and an extra 5-10 minutes is needed wipe off the cloudy excess and buff in a shine to your leather shoes. Buffing is important here, as it helps to create a sealant as well as shine on the boot or shoe. Similar to our number one on the list, this 2 ounce. container of Otter Wax Leather Salve will give a deep conditioning treatment to your leather boots or shoes. The buffing will help seal and shine leather made products, and help extend their life even if they happen to be your favorite pair you wear every day. The protection you purchase with this product is a solid and smart investment. Not only does the Fiebing’s Yellow Saddle Soap work great as a shoe polish but it also doubles an all-purpose leather cleaner including use on saddles as noted in the product title. Fiebing’s formula has been tried and true and has been used since 1895 throughout the United States proves to be one of the best all-purpose leather cleaners on the market. Extending its reach to other countries around the world for use on fine saddlery, tack, and other articles of smooth leather including shoes, Fiebings Saddle Soap is one of the best shoe polishes you can get your hands on. Made of a mixture of simple beeswax and soap Fiebings makes sure to prevent brittleness and maintains its strength after use on a variety of leather accessories. Most shoe polish companies can’t vouch for the versatility of their products but Fiebings sure can! Not only is this polish great for leather boots and shoes, but it also works fantastic on leather car seats, baseball gloves, belts, furniture, and of course, saddles. Its versatility on other leather products makes this brand of polish one of the unique and useful products in the industry. You can never go wrong with Fiebing’s saddle soap. It brings a mix of versatility, and high-quality ingredients which make for a fantastic all-around U.S. made product. It’s versatile enough that you can rely on it for not only shoes but many other leather accessories at quite a low price considering its size. One of the giants in the shoe polish industry and a must for military footwear as its formula quickly permeates and seeps into the leather to remove any scuffs and scratches, a go-to mirror shoe polish suitable for all leather shoes and accessories. Kiwi features a creamy substance composed of a simple but highly effective blend of many waxes including their highly perfected carnauba wax ensuring to keep your shoes looking great and free of any noticeable damage. This kind of product is sure to give an extra shine to your leather shoes when polished and buffed to perfection. 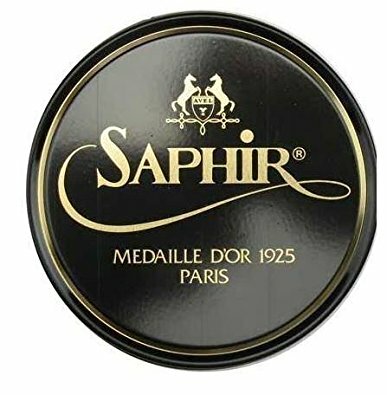 Although this brand of shoe polish does not provide that extravagant glossy look like the Saphir Medaille d'Or may, it excels in the concurrent usage of cleaning your shoes often to clean up any scratches. In addition to providing a fantastic but not to flashy looking mirror finish, it will satisfy not only those who see your shoes but yourself included. The Kiwi Shoe Polish Paste comes in an 8-ounce container, and with its relatively cheap price, makes this shoe polish another great budget option. With a subtle shine and also acting as a great shoe cleaner, it's clear why this shoe polish is the go-to option for not only the Military but everyday shoe and leather enthusiasts as well. Saphir has been making quality polish and crème products on the market for quite some time, and with their base established in France, you can be certain this company knows what leather needs. Two of their products fall in our top ten list, the first being their Crème Surfine, a pigmented crème great for all-purpose leather product treatment. Combining beeswax base with conditioning oils and pigment, Saphirs Crème Surfine will help keep your shoes from brandishing discolored scuff marks, while helping to keep them protected from the elements. This crème smooths tired looking leather in supple conditioning, leaving your shoes with the original grace and charm characteristics they were created with. Slightly newer of a product than the classic Saphir Medaille d'Or, these cremes come in over 70 colors you can choose from. Use black for your black, or even dark brown shoes, but with the number of colored leathers shoe area available in these days, you’ll be able to find one best to match your particular shoe color. Apply this regularly to help maintain luster and color, and it’s best when used in combination with proper wax polish, such as the Pate de Luxe sold by Saphir. The Crème Surfine is sold in a 50mL container, slightly less volume than some of their other products, but also slightly cheaper. If you have colored leather, you’re looking to correct scuff marks, and give a deep conditioning treatment to, this product is a good one to select. Make sure to use a polish afterward for additional luxe shine! The Cherry Blossom Renovating Shoe Cream is yet another great shoe polish fantastic for all types of leathers. It also is supplied in a larger size perfect for buying in quantity. Cherry Blossom has been a staple in the shoe polish industry for quite some time, providing customers with a fantastic glow. With its composition of all natural materials, it’s a great option to clean up your shoe game. Cherry Blossom implements a blend of multiple different waxes consisting of 100% all natural ingredients for a great smell as a well as fantastic quality for all types of leather. This makes it a reliable and cheap option, especially considering the size they are available in to buy. Wax based polishes help to protect shoes from the messy wet weather, and with the more wax, the better protection you may have. To further break down what exactly makes this product so good is the ingredients utilized to get that perfect shine. This all natural shoe polish contains a blend of naphtha, lanolin, turpentine, wax (often Carnauba wax), Arabic gum, ethylene glycol, and often a colorant of some sort. Combined, it creates a fantastic high quality, all in one blend, and suitable for all types of leather shoes and accessories. The cost is great for the size of tin you get, and for the quality of ingredients. 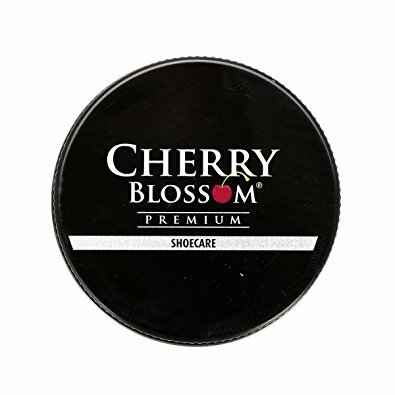 You can never go wrong with Cherry Blossom products, and this shoe polish is no exception. Cherry Blossom Cream is truly a fantastic protective product and something everyone should have in their clothing arsenal. 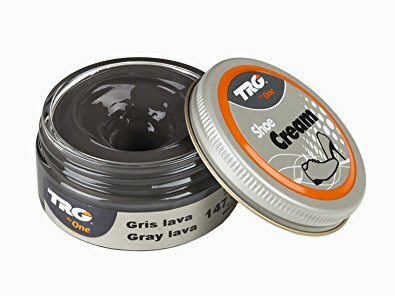 Imported from Europe, TRG "The One" Shoe Cream is a wonderful polish that nourishes and cares for your leather products with a rich and quick drying solution. In addition, it is available in over 50 colors to choose from, again perfect for those looking to touch up scuffs and scrapes! TRG shoe cream is composed of pigmented natural waxes that cleans up any scuffs and adds shine to make your shoes look great again. Also, TRG cream has a great smell due to its use of unique ingredients and can bind quite nicely to smooth leather products as well. Coming in several color hues and options on the top ten list, TRG Shoe Cream provides a multitude of high quality and choices. Select your preference to best help tailor your shine exactly to the color of your leather, refreshing your shoes look and protection as well as style. Great for synthetic leathers as well! TRG The One Shoe Cream is shipped directly from Europe to the US, as it’s not available in the US so that shipping may bump up the overall price of the product. It’s more expensive on our top ten list when we compare its 1.5-ounce container to a price similar to our top picks. However, this shoe cream is still a great show polish with a plethora of color options, perfect for leather enthusiasts. The Meltonian Cream Polish is a great budget option to take care of your leather shoes and accessories. With 15 colors to choose from and a perfect blend of wax and oil great for cleaning smooth and textured leather, it’s sure to have an option for even the most detail-oriented leather enthusiast. The Meltonian Boot and Shoe Cream comes in a 1.55ounce size and due to its blend of waxes is ideal for use with a brush. It’s a great option for those who aren’t looking for a glossy finish, but rather a subtle shine, to protect and make your shoes look like new again. Coming in 15 different colors ranging anywhere from Light Brown and Navy to Red Mahogany and Taupe, Meltonian provides great quality pigmentation. Even some of the more obscure colored leathers will find a suitable option to match their unique coloring. For the size and price, it allows you to clean and shine your shoes to your liking, without worrying about any hue mismatch after treatment. At one of the cheapest options on the list, the Meltonian Boot and Shoe Cream provides a great price for its protection factor. With the addition of a free return if you’re not satisfied with your purchase, it’s a smart buy as well. This is an absolutely fantastic option if you have textured or smooth leather shoes. Stock up for all your colored leather needs! But what is the difference between polish name types, and what does each do? There are a few main features to consider in the name of a polish, which defines the texture and main ingredients of the polish. Shoe Wax – the consistency of the polish you select may have a little to 100% wax as one of the ingredients. Wax is what helps to protect the leather, and given its hydrophobic properties, helps give the shoe a water-resistant property. Seals and Protects against water, mud, heat to a limited extent. Can be applied with a rag or sponge, left on for 5-10 minutes, and wiped off or buffed. Covers scuff marks when combined with a pigment to make shoes look new again. Easily cleans a shoe when polished or buffed with a brush or rag, giving a luster like quality to the leather. Shoe Conditioner – A good leather conditioner is something that is readily absorbed into the leather to help keep it supple and prevent cracking and signs of wear over time. Doesn’t require any wiping off unless an excessive amount is left on the shoe. Conditioner should have noticeable results immediately once absorbed by the leather, seen in the supple quality and softness of the leather. Shoe Cream – Shoe creams help to add moisture to the leather, but unlike a conditioner, this layer of treatment remains on top of the shoe instead of being absorbed. Can be buffed or polish as it doesn’t absorb into the leather, but will not give the glow and luster of a wax based product. When searching for any type of shoe polish the first thing you should consider when picking your brand is the type of leather your specific shoe has and choosing your polish accordingly. To make sure everyone is accommodated when purchasing shoe polish we included brands that work on all types of leather as well as more specific options such as synthetic or smooth leather. The Polishes we chose for all types of leather also operate as a multi-purpose glower as well, working on a variety of surfaces and product. These options are specifically tailored to those that aren’t very experienced in the world of shoe polishes and work perfectly as a budget everyday shoe glow option to keep your shoes healthy and looking great. On the other hand, one of the most popular types of leather used on the vast majority of shoes on the market is smooth leather. Brands such as Saphir are great options for this type of shoe as they provide great nourishment in extending the longevity of your shoes. The components that make up a particular shoe polish are one of the main deciding points used to choose what brands to include on our list. Features such as the type of finish, smell, and cleaning ability are all considered and fall under this category. The finish or glow left by a specific polish may more or less be a main buying point for the customer. Anything from glossy finishes to mirror finishes, are included in this list to tailor your needs to exactly what you’re looking for, but we also covered polishes that cover scuffs or condition and protect your leather shoe. The smell of polish usually goes hand in hand with the quality of a specific mixture. This may not be a big deal for some, but a pungent type smell should definitely be avoided, and we’ve of course made sure to do so in this list as well. Last but not least, is the most important feature a shoe polish should have and that’s of course ability to achieve the desired results. Every product featured on this list is a top of the line shoe product, each with their own strengths, perfect for covering up scratches, and in some cases, will work equally as well as a multi-cleaner. Shoe polish ingredients can also become technical, based on the level of glow, protection, conditioning, or pigmentation you may need. Natural Butters and Oils – Many times found in conditioners, natural butters and oils help keep a supple quality to the leather, but can also help give it that one of a kind shoe smell, like you’ve just stepped out of the leather store. Sometimes these ingredients are added to high wax or cream type products to give a pleasant scent, and slight conditioning feature to the product. Pigment – Usually helps to cover up scuffs, and found in most wax or cream based products. Natural ’pigment’ is mainly a yellow to clear color, which reflects the wax base many polishes can have. Conditioners may have a slight tint to them, but not nearly as opaque as a cream or wax polish. Another key factor that we took into consideration when evaluating our items is their ease of application. Cleaning and conditioning footwear can be a long and arduous process if the products you are using have a complicated method of application, if you are not clear what type of brushes or cloths you are supposed to use, or - worst of all - if they tend to spill and run all over your hands and the floor, causing a mess. Some options in this guide make your life easier by coming with an applicator of their own, which help you apply the product quickly and efficiently and spare your fingers from greasy stains. Those which do not usually come with a set of clear instructions on how to best apply them for maximum effect and minimum damage to your surroundings. A great benefit of polishing your footwear - and again, one of the main reasons it should be done on a regular basis - is that this process keeps the leather soft, supple, and shiny. That’s right - it isn’t only about the rugged aspects, about protecting your footwear from the tough outdoors, but it is also for keeping your it as good as new, for restoring its original glow and for making it comfortable again. That is not to say that all hope is lost for footwear which has lost its shine, is dull and cracking, grown stiff over the years. If your first thoughts were to throw it away - don’t! There is still hope for these poor neglected things, even if they haven’t been cared for in a long, long time. Thoroughly cleaning and conditioning with proper products can breathe new life into your shoes, and you will find yourself with a near-mint pair of shoes which you can continue wearing for even longer. Anytime you have a bit of a lackluster shine on your normally glistening leather shoes, it could be time for a quick polish and buff. Scuff marks are easily erased and covered with colored polishes as well. After you apply a polish, it's up to you if you just want to simply wipe them clean, giving a renewed color and slightly duller sheen to the shoe, or if you want to use the rag or a buffing brush to polish them to a perfect shine. Bee's wax polish usually shines up quite well if you're going for an eye catching shine! q: Why is shining shoes so important? Leather isn’t like many of the other materials shoes are made out of; leather gets dry and cracks while also picking up a few scuffs and scratches upon wearing them. It isn’t so much to make your shoes look good (although that’s an added plus), rather its about making what you purchase last and extending its lifetime. q: How frequently should I be shining my shoes? There are many factors that determine this such as: How often you wear them, noticeable damage, etc. In general, applying polish once a week works fine for most but of course, it varies from person to person. q: What Is The Difference Between Cream And Wax Polishes? Cream penetrates the leather quite well aiding in color rejuvenation whereas wax polishes rather help in protecting the leather. In theory, you should use both for maximum maintenance ability but that's of course completely up to you. q: How Much Should I Use When Applying These Products? It’s always best and of course safest to apply conditioners sparingly. Apply accordingly because too much will over soak and ruin the leather. q: Do I really Need A Brush? Yes. Cream polishes in specific are quite saturated and can easily ruin cloth as well as stain your fingers, same goes to some extent for wax as well. Not to mention the fact that the brush bristles get into the leather much more effectively and make cleaning a lot easier.